Caution: This Product Contains Natural Rubber Latex Which May Cause Allergic Reactions For Those Who Are Sensitive. For those who are sensitive to rubber products try our Latex Free Coflex. Coban Wrap adheres to itself and therefore requires no adhesive, clips or fasteners like most wrappings. Coban wrapping tape is light weight and provides non slip support. 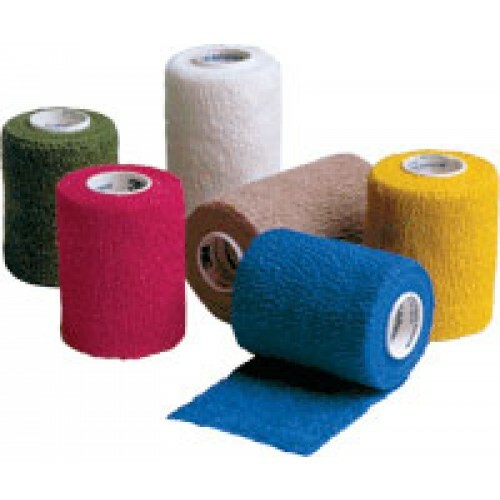 This medical wrapping tape is a latex-free wrap that comfortably adapts to the contours or the body, providing protection and absorbing shock during athletic activities. Coban Self-Adherent Elastic Wrap functions like a tape, but sticks only to itself. Available in a variety of widths to meet your application needs. It's a laminate of non-woven material and elastic fibers to provide elasticity. This elastic wrap contains a cohesive material that makes it stick to itself but not to other materials or skin. 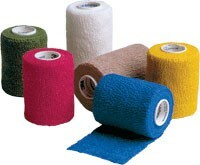 Coban Wrap has both many medical and athletic applications. 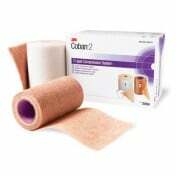 Coban can be used as a compression bandage to reduce or stop bleeding while promoting circulation and healing. It can reduce bruising and help control swelling. Sports enthusiast use Coban as a support wrap for the foot, ankle, leg, knee, shin or other parts of the body. Hospital and clinical applications include holding IVs in place, affixing monitors, vascular post-operative wrap, support wrap, bandage, edema control, leg ulcer wrap and finger immobilization. Coban tape is often used as an over wrap in conjunction with the Unna Boot. Self-adhesive tape with no clips or fasteners. Comfortable for patients and atheletes. Lightweight and porous compression wrap. Wrapping splints and arm boards. Over wrap for Unna boot. Securing I.V.s and other devices. 3M Coban Self-Adherent Wrap directions for use. You will see many ways of wrapping but we recommend a specific method to deliver tension and compression evenly and consistently. Coban Wrap is not an ordinary elastic wrap. It will not slip or loosen with time. Therefore, it must be wrapped to be comfortable to the patient immediately after application. Follow these easy steps: To start, you need to hold the product correctly. Hold the roll so that the outer side of the Coban will be placed in contact with the limb being wrapped. This allows you to unwrap additional material with more control as you wrap around the limb. Step one – unwind 12 or more inches of Coban wrap from the roll and allow the wrap to relax. It is important to unwind the sufficient length before beginning to wrap. Step 2 – without stretching, apply one full wrap and overlap. Press overlapped area lightly to keep the end in place. Step 3 – continue wrapping, applying tension to the wrap only to obtain desired compression. Remember to unwind more Coban wrap from the roll so that the product is not applied with too much tension. Step 4 – cut off or tear excess wrap. Release the tension on the last two to three inches of Coban wrap and press firmly against the underlying wrap to keep it in place. Secure the application by gently pressing layers together to ensure that the bandage windings cohere to each other. We call this “giving it the 3M hug”. Removal: Remove with bandage scissors or by unwrapping. Now that you have learned the basics about applying and removing Coban Self-Adherent Wrap, I wanted to show you some tips for applying Coban Self-Adherent Wrap for specific applications. Apply a dry sterile 2x2 inch gauze sponge over the puncture site. Determine the length of 1 ½ inch or 2” Coban Wrap needed by measuring 1 ½ wraps of the patient’s arm. Cut or tear that amount from the roll. While applying digital pressure to gauze sponge, place Coban Wrap over it and gently stretch to begin first wrap. Complete the wrapping gently but securely and observe for signs of constriction. Release the tension on the last 2-3 inches of Coban Wrap. Press bandage in firmly against the underlying wrap to keep it in place. 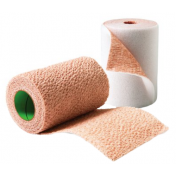 Application instructions for zinc paste bandage indicate applying Coban at 50% to 100% stretch while holding the roll close to the foot and maintaining a consistent level of stretch or even compression with 50% overlap of the Coban Wrap. After applying the primary dressing, place a splint under the finger if needed. Unwind a length of one inch Coban Wrap from the roll and allow the wrap to relax. Without stretching, apply one wrap around the tip of the finger and press the overlapped area lightly to keep the end in place. Continue to circle the finger, working back from tip to base. Release tension on the last section of wrap and press firmly against the underlying wrap to keep it in place. This technique is for initial or short-term immobilization and in most cases, should be removed after 24 hours. 6 Inches? Looking for 8 to 10 inches. The widest we carry of this item is 6 inches. We may be able to special order the product; however, should the manufacturer stock 8-inch wide tape. About how many patients can I get from a roll of coban after drawing blood for the lab? Number of patients per use is dependent upon a number of factors. We recommend contacting the manufacturer for an approximation of patient usage. If sale price of i inch tape is $.88 how can 30 rolls cost 45 dollars? Prices are subject to change and are based on a number of factors. We've since adjusted the price of the item to be more in line with current pricing for the item. I use to teach physical therapy so I know about Coban wraps so I bought different sizes and colors because I have had the need for its use. The prices here are great and the Coban quality is great. I am experiencing issues with my toes and bunions and this is great to taping the toes together to avoid some of the deformities and keeping the arthritis from having the toes cross over. Great support system for this issue and comfortable and better than using the bulky devices I have bought that made it so uncomfortable with shoes. I have ordered from vitality medical online and on the phone you all have been so great will keep ordering from you from now on thanks vitality medical. been ordering from vitality medical online and on the phone everyone has been great keep up the good work vitality medical. Best place to order medical supplies. They are very efficient. Happy to see that Coban will hold up to many types of daily wear and tear, daily activities and still manages to keep its hold. Product works great and as advertised. Sticks to itself, not to skin. Good wrap for diabetic wound care on toes. Good price, highly functional, arrived quickly.